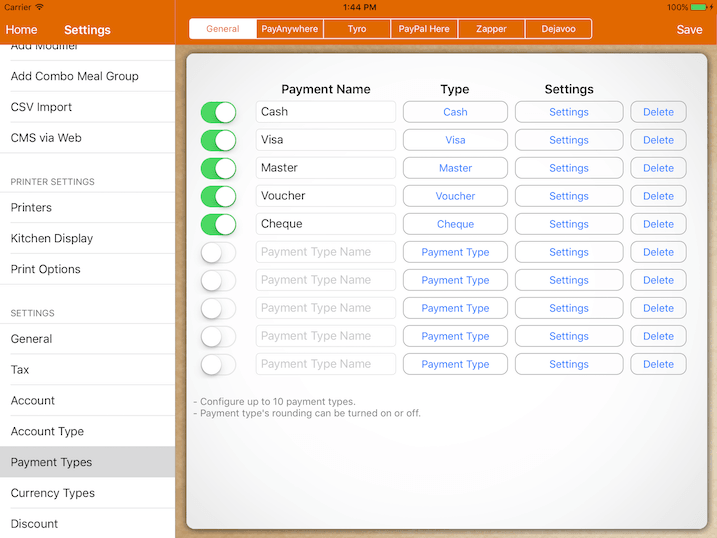 Configure up to 10 payment types. 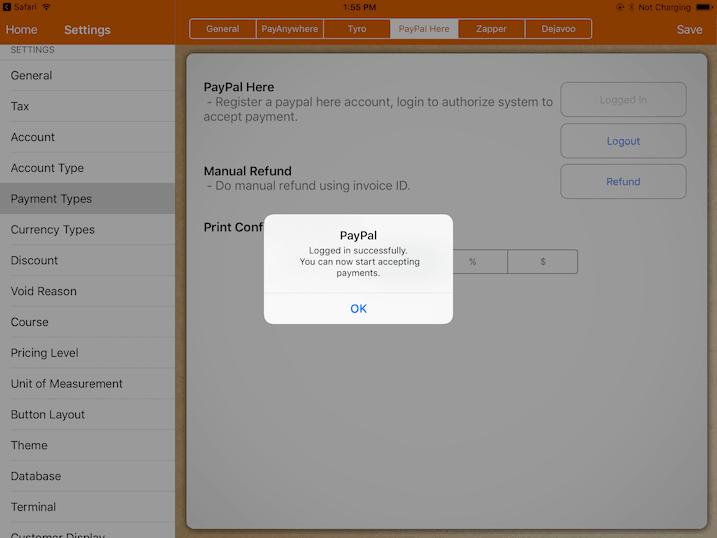 If the payment type is deleted or modified, it will affect past report reading. If the payment is set as Cash, payment closed with this payment will affect the till balance. Rounding can be switched on or off for each individual payment. If rounding is switched on, it will follow the rounding setting under restaurant setting. Drawer will pop depending on which payment type is used to close the bill. Switch on to pop the drawer. If credit card info is switched on, it will prompt you to enter credit card information before payment. Information entered will be printed out on receipt. This is solely for recording purpose as it does not process the information. Payment selected will add an extra surcharge to bill if it's turned on. Before turning it on, a tax with the type of payment surcharge has to be setup. Please refer to Tax Settings -> Tax For section for more information. To link the connection of your Tyro terminal with MobiPOS, it requires Merchant ID and Terminal ID. This information can be found on the terminal device itself or you could contact Tyro to seek help on this. Choose your device type that is displayed at the bottom, follow the instructions to authorise the link. 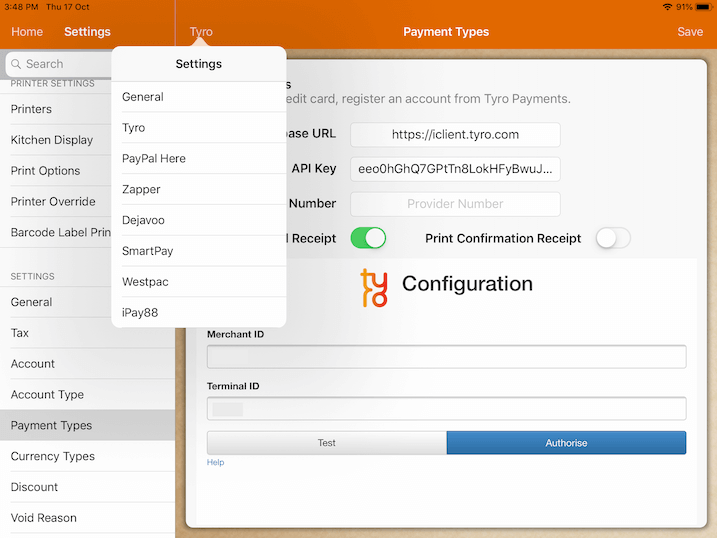 Upon setting up the link, create a new payment with Tyro Payments as the payment type. Closing bill with this payment would initiate the terminal to process credit card. In order to use Paypal Here, make sure you have a Paypal Here account registered. This guide will focus on the login process. Under Settings -> Payment Types -> Paypal Here. Click on Login and you will be lead to the safari browser. 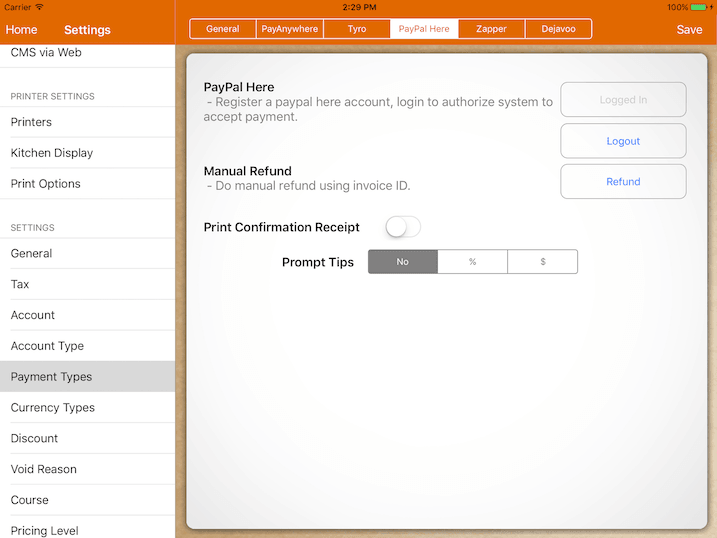 Login to authorize MobiPOS to process payments on your behalf. This may take a few steps. If the authorization process is successful, you will be directed back to MobiPOS. 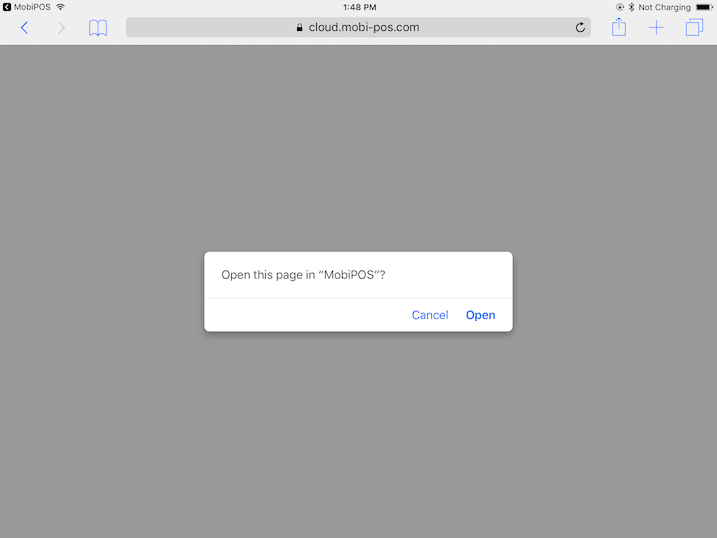 Open up MobiPOS and you'll see the message below. 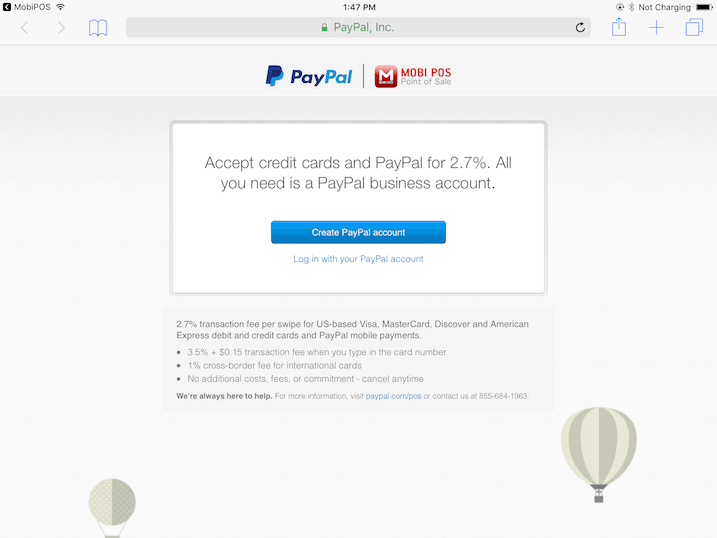 Create a new payment with Paypal Here as the payment type and you should be up and running. During the authorization, if you did not see the pop up asking to open up MobiPOS, it means you do not have a valid Paypal Here account. Zapper allows your customer to pay using their mobile phone. Download pdf below to learn more about zapper setup. Enter your credentials and you will be able to process payments. * The only PayAnywhere card reader that works with MobiPOS is PayAnywhere Mobile.